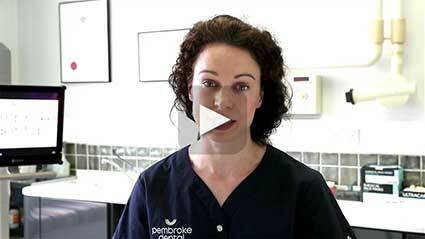 Dr Eimear McHugh is our resident Specialist Oral Surgeon at Pembroke Dental Ballsbridge. She provides a full range of services in Oral surgery (extractions/ wisdom teeth removal/ bone grafting/cyst removal and biopsies) and Implant dentistry for our patients but also accepts referrals from other practices. If you are a nervous patient, Dr McHugh also provides in house IV sedation. You can request a consultation with Dr McHugh by emailing info@pembrokedentist.ie. Teeth and gums can develop problems that require more than just a filling or cleaning. If you are experiencing discomfort related to more complex dental health concerns, our dentists can restore a healthy and functional foundation for your entire smile through specialist dental procedures and oral surgeries. Extracting problematic teeth is often the first step towards rejuvenating your smile. Once they are gone, you can replace those teeth with durable and beautiful restorations like dental implants. On occasion, it’s necessary to pull a tooth to prepare the mouth for orthodontic treatment. Simple tooth extractions don’t take long at all. They are also pain-free and comfortable, thanks to dental anaesthetics. If the idea of getting a tooth pulled makes you nervous, then the intravenous sedation option available at Pembroke Dental Ballsbridge can help make your treatment a relaxing experience. Wisdom teeth, or third molars, have a bad reputation for a good reason; they are prone to getting impacted. Impaction is when a tooth grows in at a wrong angle and puts pressure on another tooth. This can result in tooth root resorption and tooth crowding. Additionally, wisdom teeth are hard to keep clean, so they are at risk of developing decay and periodontal disease. You may need to have your wisdom teeth removed if they are causing you pain or become infected whilst erupting into your mouth (pericoronitis). Your wisdom teeth should also come out if x-ray imaging reveals that they are poised to emerge at a dangerous angle. Pembroke Dental Ballsbridge offers comfortable and relaxed removal of wisdom teeth in Dublin, D4. Whether you only need one wisdom tooth removed or require an extraction of all four third molars, our specialist oral surgery dentist can help. Specialist dentistry also includes the surgical placement of dental implants. Many Practices will place implants for you but few have a Specialist oral surgeon to do so. Implants replace natural teeth that have been lost or extracted. An implant consists of a metal screw topped with an attachment called an abutment. This abutment is what secures the dental crown restoration to the implant. An implant screw is placed into a hole that the dentist drills into the jawbone. Over the course of several months, the bone tissue heals up around the implant in a process called osseointegration. This seals the prosthetic tooth in place and creates a stable foundation for biting and chewing. Dental implants are a popular restorative option because they are strong, durable, natural-looking and require only basic maintenance. Although the concept of placing a dental implant may sound uncomfortable, the reality is that it is a very simple procedure. The oral surgeon makes a small incision in the gum tissue to expose the bone. A tiny hole is drilled in the bone. The implant is screwed in place and the gums are stitched back together over the surgical site. All of this takes only a few minutes and you won’t feel a thing after receiving dental anaesthetic. After a few months of healing, the surgeon will reopen your gums to attach the abutment or healing cap onto the implant. Your gums will be allowed to heal around this for some weeks before the crown, or false tooth, is cemented over the abutment. You may be in need of bone grafting if you have lost a portion of your jaw to injury or disease. Grafting is a multi-step specialist dental treatment. The oral surgeon carefully maps out which areas of your mouth need restoration and then selects the suitable material. You may need a separate procedure if you will be using bone from another site in your body to restore your mouth. After ensuring that the graft has been accepted by your body, the oral surgeon can move on to the next step of rebuilding your smile. This may include dental implants or a denture. Bone grafting may also be necessary for replenishing depleted bone levels. Teeth affected by periodontitis may have lost significant bone support and need grafting to protect and stabilise their roots. From suspicious growths to painful cysts and excess tissue, all of these issues can be treated by our oral surgeon with specialist dentistry at Pembroke Dental Ballsbridge. Dr Eimear McHugh has extensive training in treating soft tissues in the mouth, in addition to tooth and bone. Braces can improve your oral health and enhance the appearance of your smile. If you are undergoing tooth alignment correction using braces, your mouth may first need some pre-treatment in order to optimise your orthodontic treatment. For example, you may need to have a tooth or two removed so that there is enough space for your remaining teeth to be coaxed into a straight line. Or your canine teeth might need to be surgically exposed, in order to allow better access for attaching braces. Whatever your orthodontic needs may be, you can count on the specialist dentistry team at Pembroke Dental Dublin to help you maintain optimum oral health. Specialist Dentistry in Dublin D4—Ready to Give it a Try? There’s no need for referrals to another specialist when you visit Pembroke Dental. Keep your dental treatment centred under one roof, by choosing the most comprehensive specialist dentistry and oral surgery in Ballsbridge. Call today to book an appointment with our team.